radio therapy: a meditation on healing. musician and sound artist martín rodríguez guides listeners in a meditation on healing processes that are not the stereotypical peaceful, glowing, warm processes we may be conditioned to imagine. inspired by his experiences with chemotherapy and radiation, rodríguez opens us to the more aggressive modes of healing that are necessary for transformation. working the spontaneous sounds from the radio from an unknowable intensity into a soothing and battling ambiance, rodríguez speaks to the uncertainty of recovery and remission that are part of healing. this meditation is inspired by his work entitled radio therapy, developed as an original way of producing music for rodríguez during cancer treatments, and as an embodiment of his healing process. the vibrational resonance of this work takes on symbolic importance and acts to reach participants and unify through shared sound waves, rhythmically pulsing through our bodies. radio therapy is produced by harnessing radio frequencies through a transducer that is attached to a standalone guitar. the transducer forces the whole body of the guitar to vibrate. 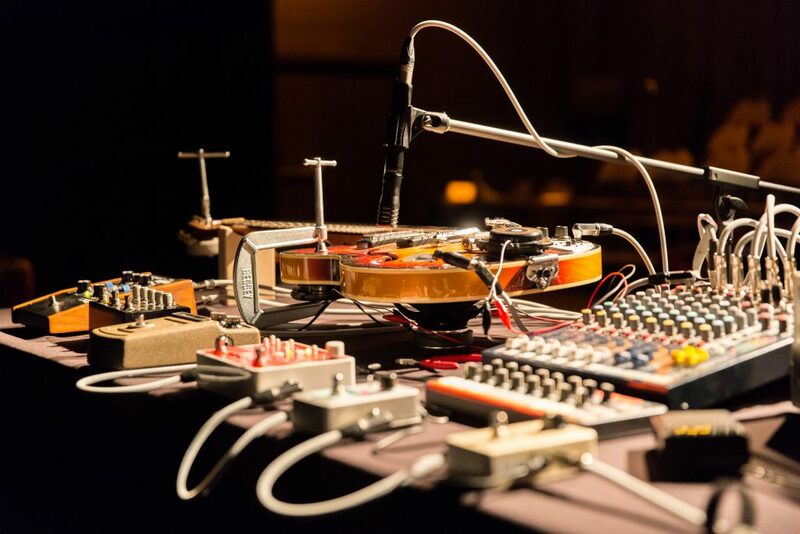 the resulting sound is a blend of musical notes, and scanned am radio frequencies resonating through the body of the guitar and passing through a chain of manipulated sound effects to then reach and resound throughout the room. this meditation offers a space for participants to face their own difficulties and ease into welcoming the burden of transformation through a sonic narrative. for more information on martín rodríguez, see here:. This entry was posted in listening series and tagged healing, martín rodríguez, montreal, never apart, noise meditation, radio therapy. Bookmark the permalink.